JABSOM has actively incorporated strategic planning since Dean Hedges arrival in 2008. These efforts have guided global and mission specific growth and development of the School. 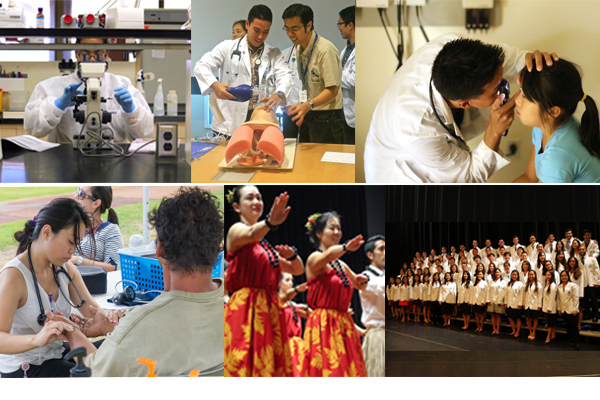 This strategic planning effort has incorporated strategic initiatives at the University System, Mānoa Campus, Kaka’ako (satellite) Health Sciences Campus, School-wide, Departmental, and Program levels. Documents available on this webpage addresses the planning effort in broad strokes and focuses upon larger JABSOM School-wide initiatives. Acting with forethought regarding right relationships, respect, and ethical action — Pono. In 2011, the JABSOM Executive Leadership Team synthesized the overall themes from the multiple strategic planning sessions and developed the strategic planning Summary shown below. This Summary has driven subsequent JABSOM strategic planning and evaluation activities, with the implementation of multiple tactics designed to fulfill the overall goals (short-term, medium-term, & long-term). A strategic planning consultant worked with many department chairs to help incorporate JABSOM strategic goals into their departmental strategic plans. This Summary has been used in multiple settings to emphasize the JABSOM mission and community service priorities, including during multiple subsequent mission-focused strategic planning sessions.